your digital assistant for business. Ask questions – get answers. 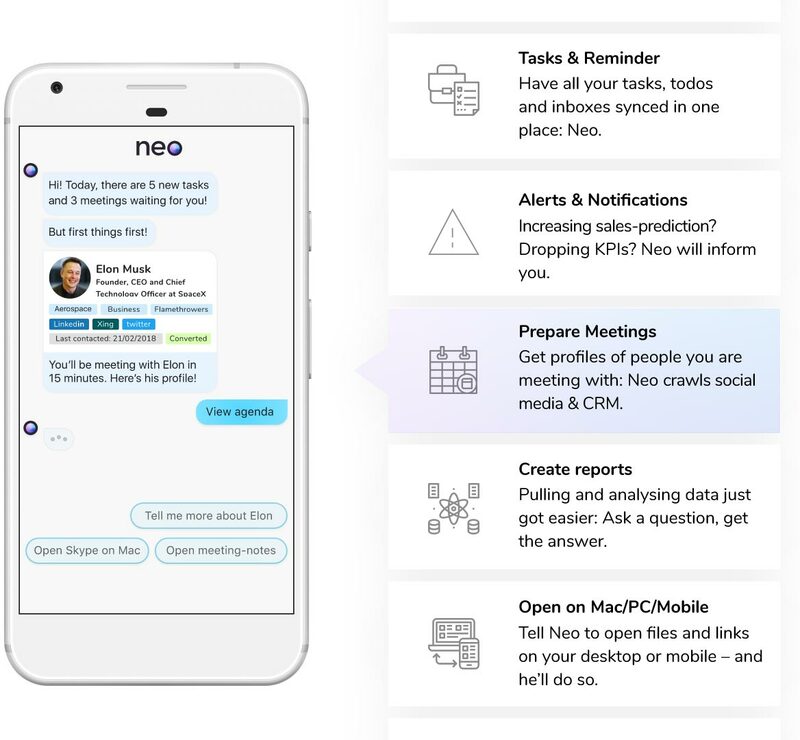 Interacting with your tools at work can be as easy as that if you hire Neo as your digital assistant. Focus on what matters to you. Leave everything else to Neo. Hi, my name is Neo and I’m your personal AI-assistant. Ever came to work and didn’t remember, that today is one of your coworkers’ birthday? Did you ever feel annoyed with synchronizing your email-inbox, calendar and To-Do-list at work? Or rushing into a meeting without being able to prepare notes and pull the most-recent data? Tired of checking out dashboards? Neo will inform you, if an important metric is changing. 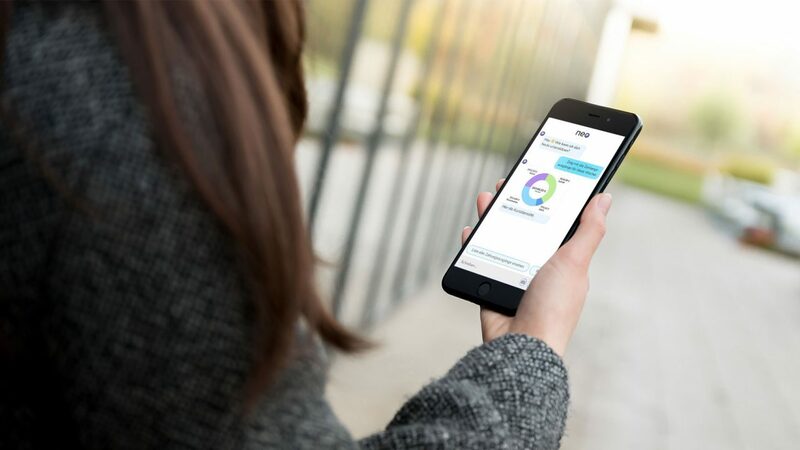 Before a meeting, Neo will aggregate CRM-data and web-profiles of the people you're meeting with. New to a team, role or project? Relax. Neo will guide you through the onboarding. Focus on what's fun, exciting and challenging at work. Leave everything else to Neo. Your digital assistant is at your hands to work with your tools and services – no matter, if you’re using your phone, a notebook or a desktop-computer. Get introduced to our AI-assistant Neo at an upcoming event! Let Neo take out the friction of your everyday processes and tasks. Will you replace any tool/platform/software? No, we will not attempt to replace any tools you are currently using. Instead, we will allow you to have an overview of all your tools in one place and enable your tools to communicate with each other (if needed). You can think of Neo being similar to the super-mom (or -dad), who knows all the schedules of the kids, coordinates everyone’s schedules and remembers all the important stuff. We don’t replace any tools, we just make sure that you are using the right tool at the right time, and that you have all the relevant information you need at hand. 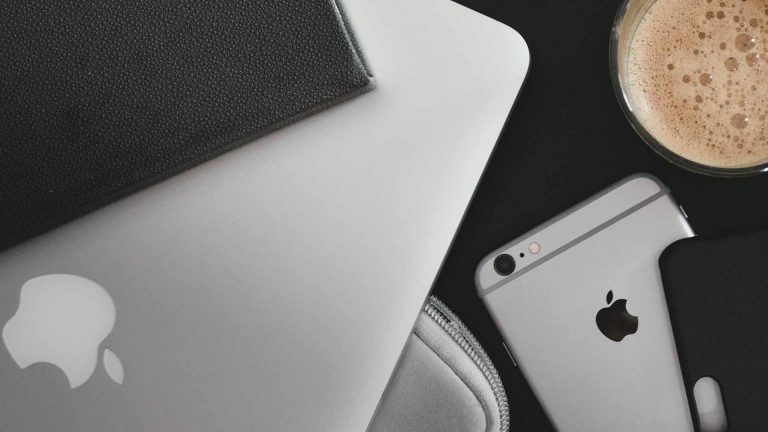 We currently see a lot of personal assistants evolving in the consumer-sector, such as Apple’s Siri, the Google Assistant or Amazon’s Alexa. All the major tech-companies are leveraging the importance and usefulness of AI-based assistant to make our daily life easier. However, this has not been done in a B2B context – mainly because (1) you handle very sensitive data (so it might have to be hosted on-premise), (2) because you have to integrate a lot of B2B-only-systems (such as SAP, github, Slack, Outlook, …) and (3) because it does not match the business models of the major tech companies (which rely on collecting data, targeting advertisement and/or selling hardware). How is this different to a task-management-tool? We love To-Do-management-apps and -tools to keep track of our tasks. However, an assistant is not there to keep a list of your to-dos – s/he should be capable to do so much more than that. A major issue with task-management is that there’s such a variety of tools and inboxes, that we spend a lot of time to manually enter tasks into our To-Do-management-systems in order to have an overview of our work in one place. Whilst we see the power of task-management in collaborative projects, it does not make sense to manually sync tasks from different systems into your to-do-list – Neo will automatically provide you with an overview of your work based on all the systems you are working with (including your To-Do-lists)! There are two major factors in making Neo work: (1) Solving the technical challenges (such as integrating systems, training the AI, …) and (2) building a product that users(!) actually want to use. Whilst the technical part will be very challenging, it can be solved by building and incrementally improving the product on a use-case by use-case basis. We believe that, although we are selling our product in a B2B-setting, the user-experience and user-adoption is the critical success factor. If users don’t want to use the Neo, our selling-arguments (i.e. saving time, increasing efficiency and productivity, …) will be nipped in the bud. When will Neo go live? Great question – and good news: We're currently piloting our technology with global players, enterprises and "Mittelständler". So, if you want to get a glimpse of what the future of work could look like, we'll be happy to demonstrate Neo's abilities in a pilot project with you! Will technology enrich human creativity? 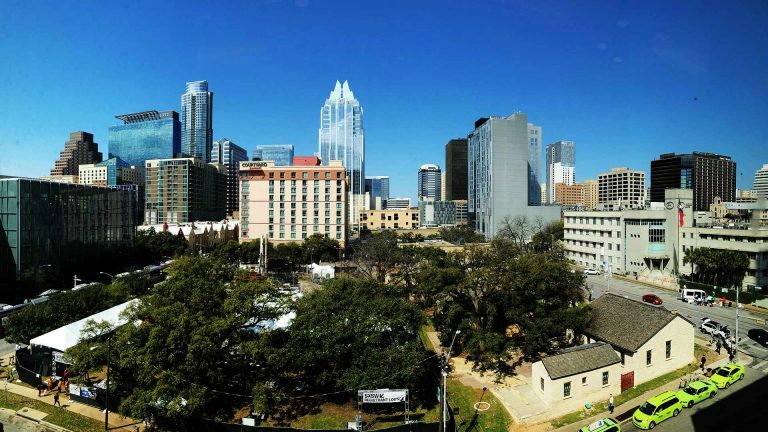 This is one of the many questions discussed at SXSW in … Continue reading about 5 Takeaways from SXSW 2019: Neohelden in Austin, Texas! 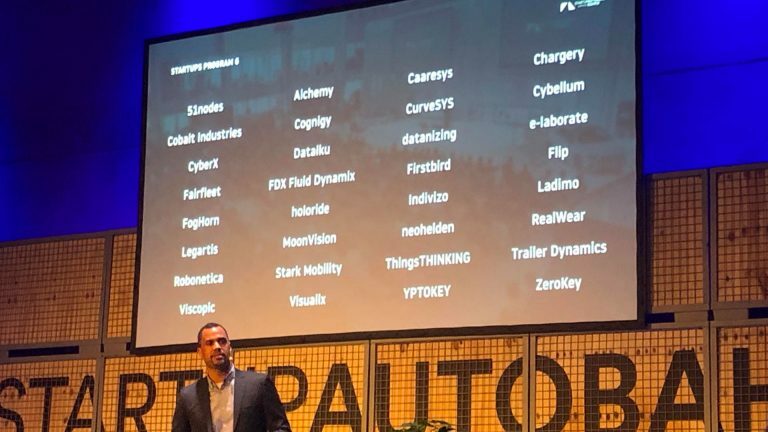 On February 21, 2019, the time had come: During Startup Autobahn’s EXPO Day #5, the startups of … Continue reading about It is official: Neohelden were selected to program 6 of Startup Autobahn!